Luke: He was a right-wing a**hole. Paulie: That's still no excuse to kill anyone! Jude: It's a pretty good reason! I have always felt that once people have made up their minds on an issue, it is nearly impossible to persuade them to consider an alternative. Bearing that in mind, I will say that it must be dreadfully difficult to create a film that attempts to demonstrate the futility of political activism, much less a comedic film. We all have strong beliefs of what we feel to be right or wrong. Even those who do not support either liberalism or conservatism typically defend their neutral beliefs with great fervor. Of course, few of us ever stop to consider that the lines of right and wrong are frequently blurred, especially when it comes to political viewpoints. The main characters in The Last Supper are so blinded by their own beliefs that they have lost sight of what it truly means to have an opinion. These five Iowa graduate students not only share a house and a left-wing outlook, but also the same kind of closed-mindedness that they all despise. On a stormy night, one of the roommates' car breaks down and he receives a ride home from a passing stranger named Zack (Bill Paxton). The group asks him to stay for dinner, as we learn that the roommates have a weekly ritual of inviting a stranger over for dinner to engage them in a little "small talk." The conversation quickly develops into anything but the trivial when they discover Zack's militant and racist outlook on life. This is one of the high points of the film, as director Stacy Title methodically elevates from an already high moment of tension to a shocking conclusion. A scuffle ensues, and a bad situation becomes much worse when one of the roommates stabs and kills Zack with a large kitchen knife. After the initial shock wears off, the friends bury Zack in the backyard and try to alleviate the guilt of his murder. "It's not like we killed Mozart here, we killed a guy that I'm sure was an evil force on this planet!" one philosophizes. "What if you killed somebody whose death makes the world a better place?" another suggests. "Think about all the right-wing a**holes the world would have been better off without if someone had wasted them before they did any damage." Thus, after bickering a bit, the roommates begin a left-wing crusade to liberate the world from right-wing evil. They continue to accommodate weekly dinner guests, only now their visitors are carefully chosen right-wingers. Two decanters of wine are served with dinner; the blue decanter is safe, while the green decanter contains a lethal amount of poison. When the roommates come to the conclusion that the world would indeed be a better place without their guest, out comes the green decanter. Several of their victims include a homophobic reverend, a male supremacist, and an anti-environmentalist. The wonderfully cast roommates, played by Cameron Diaz, Ron Eldard, Annabeth Gish, Jonathan Penner and Courtney B. Vance are delight to watch. They may be ignorant, but they have been scripted with an intelligence that each actor wisely conveys. When we witness their gross errors of judgment, it is obvious that it comes from their blind refusal to compromise rather than just sheer stupidity. The film also features a handful of wonderful cameos by Charles Durning, Mark Harmon, and Jason Alexander as disagreeable dinner guests. Though The Last Supper does become somewhat monotonous—as we see one conservative after another succumb to the liberals' fiendish plot—the message is intriguing and expertly delivered in the last fifteen minutes. When a popular conservative talk show host (Ron Perlman) graces the roommates' dinner table, he masterfully yet subtly demonstrates the irony of the roommates' crusade, proving the senselessness of those who believe their opinions to be so righteous that all other's opinions are worthless or invalid. Ultimately, we see the roommates reduced to nothing more than the prejudice that they try to withstand. Although I believe the message of The Last Supper to be a good one, I wish I could say that it was as black and white as it sounds. Yet, like any controversial subject, people are bound to read too far into it. We all tend to be quick to judge and slow to understand, empathize, or even tolerate. By the end, most viewers will likely view the film as too pro-liberal, too pro-conservative, or perhaps too opposed to one side. I found that it teetered back and forth, often seeming too swayed towards one temperament but usually finding its way back to neutral territory. Perhaps the film itself is the ultimate irony, using its dense subject matter as a method of toying with the minds of those who attempt to find greater purpose other than the pitch black comedy for which it strives. Image Transfer Review: For a low budget film, the anamorphic 1.85:1 image transfer is exceptional. The only distractions I noticed were a slightly soft characteristic and a minor tinge of redness in the fleshtones. Otherwise, this is a first-rate visual experience. Audio Transfer Review: The only offering is an above average 2.0 Dolby track. The surround channel proved to be stronger than I typically find from this audio format, adding a wonderful sense of spaciousness and depth to the on screen visuals. Dialogue is clear and intelligible, though sonically thin and somewhat distorted at times. Overall, the soundtrack does a suitable job of driving the film's narrative; I have little to complain about the audio transfer. Extras Review: No mention can be made of special features except for the fact that there are none. All we are given are two trailers for films unrelated to The Last Supper. This tiresome practice seems to have become the norm for catalog releases as of late, which is becoming more and more maddening. 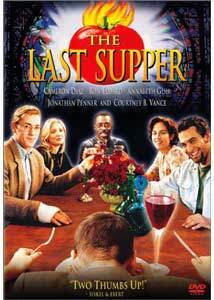 The Last Supper is one of those movies that is simultaneously frustrating and engrossing. It is filled with ludicrous plot contrivances and conveniences, but at the same time, it proves to be almost irresistibly entertaining. I could go off on a rant about all of its many absurdities, but I would rather dwell on the bottom line, which is the fact that my enjoyment of this silly film allowed me to look the other way from all of its many problems. Well�most of them, at least.